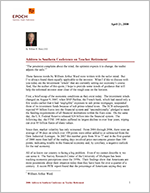 Address to Southern Conference on Teacher Retirement - Epoch Investment Partners, Inc. These famous words by William Arthur Ward were written with the sailor mind. But I’ve always found them equally applicable to the investor. What I’d like to discuss with you today are the investment “winds” that are currently setting our economy’s course. And, like the author of this quote, I hope to provide some words of guidance that will help the informed investor steer clear of the rough seas on the horizon. First, a brief recap of the economic conditions as they exist today. The investment winds changed on August 9, 2007, when BNP Paribas, the French bank, which had stated only a few weeks earlier that it had “negligible” exposure to sub prime mortgages, suspended three of its investment funds because of sub prime-related woes. The ECB subsequently injected 95 billion Euros into the financial system and “unconditionally” pledged to meet the funding requirements of all financial institutions within the Euro zone. On the same day, the U.S. Federal Reserve released $24 billion into the financial system. The following day, the FTSE 100 index suffered its largest decline in over four years, wiping out over 85 billion Euros of share values. Since then, market volatility has only worsened. From 2004 through 2006, there were an average of 38 days on which over 100 points were either added to or subtracted from the Dow Industrial Averages. In 2007 this number grew from 38 to 77 and in the first quarter of 2008 more than half of the trading days involved price movements greater than 100 points, indicating trouble in the financial economy and, by corollary, a negative outlook for the real economy. All of us know our country is facing a big problem. Even if we cannot describe it, we can sense it. The Survey Research Center of the University of Michigan has been tracking economic perceptions since the 1950s. Their findings show that Americans are more pessimistic about their situation today than they have been for over a quarter of a century. A recent PEW report found that the percentage of Americans saying they are better off now than they were five years ago is at its lowest level since polling started in 1964. Home sales are plummeting, foreclosures rising, employment levels declining, and the fifth largest investment bank in the country has effectively entered bankruptcy. This bank, Bear Stearns, survived the Depression. How did this happen? How did we get here? What are the origins of these winds and how long will they persist? Until we understand these questions, we cannot begin to identify the solutions – if, in fact, there are any – as to how we can get out of this mess and back into calmer waters. The actions of the Central Bank, which, in reaction to the stock market decline of 1999-2001 and driven by a fear of repeating Japan’s mistakes, established extremely easy monetary conditions, creating the conditions that fostered the housing boom. The birth and rapid growth of new financial products with strange acronyms, poor transparency of structure, and an absence of regulation. The rapid rise of “mark to model” pricing and the hand-in-hand relationship between the rating agencies and the investment banks, resulting in these new financial products being falsely deemed “safe”. The ability and the incentive to deploy the massive use of leverage across a global financial system, resulting in aggregate stock and bond values over three times the value of global GDP. Let us look at each of these factors a little more closely. First, the actions of the Central Bank. When monetary conditions were loosened, it resulted in lots of credit availability at exceedingly low interest rates, thus seeding the ground for the housing bubble of 2001-2006. In this five-year period, housing prices rose over 50% nationwide according to the Case-Shiller data in Figure 1. This chart covers 100 years of home prices. Just as the decline from 1920-1940 was unprecedented, so was the increase in the early part of this decade. It is easy to see that the gap between this most recent peak and the long term trend line is large, somewhere between 20-30%. Recently, this gap has begun close – at times quite dramatically. But in terms of returning the to historical trend-line, we are only about one third to one half of the way there. Second, the proliferation of exotic new financial products. The process leading up to the formation of the Basel accords began during Paul Volker’s tenure as head of the Fed. Under these new international banking standards, investors were given the unprecedented opportunity to compare the financial health of banks in different jurisdictions and different regulatory environments around the world. For the first time in financial history, balance sheets could be compared. However, under pressure from American banks, which felt the Basel rules discriminated against their sophisticated management and pricing practices, Basel II was born. These revised guidelines permitted banks to use their own internally created risk models to value the complex new derivatives that were not subject to the day to day discipline of cash markets. Under these revised guidelines, it was stated that if banks could show evidence of successful long-term risk management over the preceding many years of falling inflation and falling interest rates, they would be permitted to independently evaluate their own risk exposure and to use those evaluations to develop their investing strategies. These revisions to the Basel accords took place in 2004, but US banks had begun to fight for decreased regulation several years earlier. In 1999, Wall Street successfully lobbied to rescind the Glass-Steagall Act in the name of making domestic banks more competitive with their global peer group. Within one week of Glass-Steagal’s elimination, Bob Rubin was named Vice Chairman of Citicorp and resigned from Treasury. That’s what I call an effective lobbyist! As a result of these profoundly relaxed guidelines, the aforementioned menagerie of strange financial instruments was allowed to proliferate. In 1999, Alan Greenspan referred to these unregulated derivatives in a way that now seems almost tragically ironic. “These instruments,” Greenspan said, “enhance the ability to differentiate risk and allocate it to investors most able and willing to take it.” And, according to the new Basel rules, he was right! Anything with an AAA rating, regardless of its underlying creditworthiness, was deemed almost riskless, and a portfolio of risk instruments could be expected to fail only once in a thousand years. Did you hear the penny drop? Did this mean that if a sponsoring bank could get a rating agency to assign a AAA rating to this “stuff” one need assign little or no reserves against it for possible failure in the future? That is exactly what I mean. Needless to say, both the Fed and those who live by its rules are now singing a very different tune today. The third contributor to our current financial landscape is the negligence of the rating agencies and the complicity of the banks in encouraging their absurdly distorted standards. Last fall, the Wall Street Journal ran an article entitled, “How the Rating Agencies Aided and Abetted the Investment Banks in the Sub prime Crisis.” The article detailed how each party profited from this unholy collusion: the banks benefited from unearned AAA ratings and both the banks and the rating agencies enjoyed the fees that resulted from the creation of these vehicles. Let us look a little closer at the economics at work in this scenario. At Grant’s Spring Investment Conference in April of this year, David Einhorn presented a paper entitled “Private Profits and Socialized Risk.” In this paper, he outlined the incentives for the investment banks. He started with an analysis of Carlyle Capital Corporation, a publicly traded investment fund that went broke as a result of having 30 to 1 leverage. Crazy as it seems, Carlyle’s portfolio existed of 100% government agency securities. The assumption behind its construction was a woefully misguided one: that past volatility will repeat itself in the future, thus eliminating the risks inherent in massive amounts of leverage. The future, of course, bore no relationship to the past that the Carlyle Fund had hope to recapture. Volatility skyrocketed, and the Fund’s market value took a nose dive. Today, the big investment banks continue to report similar leverage with even less worthy holdings as underlying support. They are also allowed to count preferred stock and subordinated debt as equity in the calculation of leverage ratios. If we exclude these items, the leverage to equity ratio for many of these banks becomes even greater than Carlyle’s at the brink of its infamous self-destruction. And these investment bank balance sheets hold a lot of “mystery meat” to begin with. In addition to plain old stocks and bonds, there are various securitized loans, bits and pieces of structural finance transactions, derivative exposures of staggering notional amounts and related counter party risk, and a complex host of real estate and private equity concerns. Despite claiming to be in the “moving” business and not the “storage” business, investment banks have happily crammed their attics full of old refrigerators and broken grand pianos. This stuff has proven to be outrageously hard to move, and even harder to properly valuate. This motivation alone would not have been enough without the risk models developed by the banks. Suffice it to say, the so-called “value at risk” models failed miserably, leading one Goldman Sachs employee to admit last year that the losses in their funds was a 26 standard deviation event, something that should occur once in 100,000 years. Perhaps Goldman should trade in their physicists for archeologists! At its essence, the rule enabled brokers to lower their capital requirements. Under this new method, the broker-dealer could use “mathematical modeling methods already used to manage their own business risk, including value-at-risk (VaR) models and scenario analysis for regulatory purposes.” The SEC, therefore, was now allowing the industry to adopt Value-at-Risk as a principal method of calculating regulatory capital. In the new rule, the SEC was also “amending the definition of tentative net capital to include securities for which there is no ready market…This modification is necessary because, as discussed below, we eliminated the requirement that a security have a ready market to qualify for capital treatment using VaR models.” Without the modification, the “no ready market” securities would have been subject to a 100% deduction for capital purposes. With these regulatory missteps in mind, is it any wonder that, over the last few years, the banking industry has increased its holdings of “no ready market” securities and reduced the amount of capital required to engage in increasingly risky activities involving so-called Level III assets? The answer is obvious. Since this rule was implemented, the broker-dealers have modified their balance sheets to take advantage of the new rules. They have added lots of exposure to low-return bonds with credit risk perceived to be beyond the Value-at-Risk threshold, and they have added more “no ready market securities,” including whole loans, junior pieces of structured credit instruments, private equity and real estate. Einhorn’s impression of this situation is that the large broker-dealers convinced the regulators that the dealers could better measure and monitor their own risks than the regulators could. Furthermore, the dealers were confident that, armed with all the fancy math money could buy, they would prove themselves able to support more risk with less capital than the regulators advised. Einhorn suspects that, in the face of all this cajoling, the SEC was effectively duped. The regulators were easily swayed to the point of view that these large, well-capitalized institutions – with smart, sophisticated risk-managers at their helms – had no incentive to fail, and therefore deserved the benefit of the doubt. While Value-at-Risk might still make sense to the quants, it has led to risk taking beyond all common sense. If Bear’s only business was to have $29 billion of illiquid, hard-to-mark assets, supported by its entire $10.5 billion of tangible common equity, that, by itself, would be an aggressive investment strategy. However, as of November 2007, that sliver of equity was also needed to support an additional $366 billion of other assets on Bear’s balance sheet according to Einhorn. All of this is meant to underscore the danger of what can happen when investment banks and ratings agencies are allowed to engage in an unchecked pursuit of their own mutual interests. In retrospect, the resulting disaster should have been obvious. And it is cold comfort indeed that the aftermath will be with us for many years to come. The fourth contributor to the speed and direction of today’s economic winds is the dramatic impact of hedge fund investing. Hedge funds have grown to represent large amounts of invested capital, and they have achieved this prominence with extraordinary speed. Today, there are few retirement plans that do not use them, and in many cases very liberally. But their popularity lies in direct opposition to the realities of their investment style and fee structures: there are few institutions that encourage such high leverage and such a clear incentive to speculate with other people’s money. My colleague, Mike Welhoelter, and I recently wrote a paper on hedge fund fees and why they matter. It is available here. In a nutshell, asymmetric fee schedules work more for the manager than they do for the client. What’s more, they encourage irresponsible amounts of leverage. Many plan sponsors do not want to pay for Beta; but that is exactly what leverage is by another name. By signing up for such one-sided fee structures, sponsors unwittingly encourage leverage and speculation. The fifth and, with any luck, final contributor to today’s dire economic straits is the proliferation of global leverage, as facilitated by derivatives and securitization. Derivatives allow the movement of risk across asset classes and geographies at the click of the mouse. Securitization has spread risk across large pools of assets. In fact, according to the Bank for International Settlements, total derivatives amount to over ten times the world GDP, in excess of $500 trillion. Credit default Swaps totaling $43 trillion were outstanding at the end of 2007, up from $900 billion in 2000. Incredibly enough, this is more than half the size of the entire base of the global banking system. These, therefore, are the five steps that have brought us to this point. And it is a point none of us should relish. Earlier this month, the IMF indicated there was a 25% chance of a global recession, forecasting that the U.S. will grow less than one percent in 2008 and 2009. Bluntly speaking, we have not been faced with this severe a set of problems in all of my years in this business. Allow me to present a framework for looking at this problem. In my view, this framework can provide a scenario for measuring the severity of the problem, and relate everything back to the true drivers of stock prices. Figure 2 displays the relationships between the real economy and the financial economy. They are two sides of the same coin. What affects one side affects the other one as well. Now, let’s insert the inputs relevant to today’s economy. Earnings are likely to contract sharply over the near term, reflecting the drop in housing values and the consequent impact on consumer spending. Figure 3 illustrates the effect on GDP of a 20% decline in home values and the ripple effect throughout the economy at large. There will be little growth in US GDP this year and, consequently, little earnings growth for the economy as a whole. Consumer spending is likely to suffer the smallest increase year over year in post-war history (Figure 4). What makes this outlook truly precarious is the role of debt in the economy at the household level. For perspective, see Figure 5. Source: Hellasious. “Household Debt and GDP Growth” Online Posting. October 1, 2007. Median family income in the U.S. grew very little from 2000-2006, yet the economy grew as the consumer nearly doubled his debt. Household debt grew at more than two times the growth rate of GDP, leaving the consumer with very little protection in the current economic downturn. In summary, we have a world economy that is growing but at a declining rate. The U.S. economy is expected to shrink for the first time in many years. The banking crisis is expected to total at least $650 billion in credit related losses. But only 40% of this total has been acknowledged to date, so it is safe to say that we are in the fourth or fifth inning of this game. It is estimated by Credit Suisse, for example, that the banking system now requires at least another $140 billion of capital. How, then, can the informed investor navigate these changing winds and stormy seas? From our perspective, it is too early to own financials and the consumer discretionary sector looks terrible for many quarters to come. In most sectors, leverage should be avoided at all costs, as sluggish growth makes financial leverage a real negative for profits. A global perspective is required, and here it is not all bleak. Globalization is a positive for the world as a whole. Figure 6 shows global exports to global GDP since 1989. This is a phenomenal run, and it has resulted in higher productivity, less inflation, and higher profits than would have existed otherwise. However, the benefits of the wage arbitrage with emerging markets is reaching its limits, and the demand for raw materials relative to the supply is driving up prices. But globalization is threatened more by the rhetoric of populism than these forces. Our politicians do us a disservice to speak the way they do presently. If they succeeded in causing global trade to diminish, our recession would become a global depression. Figure 7 displays the important role of emerging markets to global growth. Everyone around the world now shares the same desires for improved living standards and a higher quality of life. Globalization is the mechanism through which these desires can be realized and the vehicle through which economies will benefit accordingly. In this rapidly evolving environment, what investment strategies will work? Equities will beat bonds over time; a global focus will trump a regional one; and companies that grow free cash flow, allocate it wisely, and possess little or no debt will excel. In a world where interest rates are more likely to rise than fall, P/Es are more likely to fall than rise. That means earnings and dividends determine equity returns. Valuations, then, should be performed using the rubric of free cash flow methodology. And, if this methodology is executed faithfully, both by corporate managements and investors, one will find that dividends – in the form of cash, share buybacks, and debt pay downs – will be a dominant equity strategy on a global basis along side that of one which emphasizes holding equities of firms that can truly reinvest their free cash flow at rates of return in excess of their cost of capital through internal capital projects and accretive acquisitions. So, despite the unsavory direction of the prevailing winds, we consider ourselves realists. And I hope that, as informed investors, you will join me in this perspective. It will take a clear head and a strong will to set the right course. But once the proper tack is set, it is not unreasonable to expect considerably smoother sailing ahead.